"The one whom she loves, whose name she mentions in her prayers and constantly keeps her awake at night is YOU!" Tears began to stream down Fahri's cheeks. "If only she had mentioned it earlier. Why must it be destined this way? The one news I had been waiting so long to hear have come to me just too late. Too late..."
One who has the modesty like those of pure heart. Ever striving with strength and courage as a mujahidah of Allah subhanahu wa taala. As I pen this letter, my heart remains in turmoil. I have been incessantly whispering prayers to Allah to make your heart at peace and your mind at ease, to cleanse your soul and release you from the shackles of grief and sadness. Thank you for all that you have done and all that you have said. I understand with all my heart what you have been saying. If you feel that you need to be true to your feelings of love, then I feel the need to be true to the tremors in my own heart. The tremors of guilt and fear of forsaking His Unparallelled Love for yours. Al Hubb Fillah. Love for the sake of Allah. We both know the boundaries of His Laws, and I am unwilling to traverse a path of disobedience. In life, love is not everything. There are many things more important than love. In fact, if we are in love, let that love be a doorway towards our submission to Him. Let's not let our emotions overcome us. Let's use our mental faculties, because the wonders of our mind is one of many proofs of The Creator. We still have bright futures ahead of us. We have our families who are dependent on us as their child who will share their sad and happy moments, and someone who constantly brings the light of Islam back home. Be who you were before I came into your life - a person full of spirit and zest, and who brings smiles to everyone around them. Please realize what your actions will lead to. By following your emotions, you will continue to have such deep feelings of regret which will lead to self-destruction. Remember, our religion enjoins the Straight Path and prohibits us from hurting ourselves in any way, for any reason whatsoever. Shackling one's self with grief and sadness because of love is contradictory to the Sunnah of our beloved Prophet. The pure love between a man and a woman is a love that can only exist after the couple has been solemnized. A love towards our lifelong partner which is legal in the eyes of Islam. Love before marriage is a love that cannot to be seen as either 'pure' or 'astounding'. The world is a wide expanse. There are thousands of pious men who are yet to be married, and I'm sure there are plenty of them among your acquaintances. Choose one and marry him, and you will experience a love more beautiful than you have ever experienced. A love within a blissful marriage. Sometimes, through mere accident or coincidence, we cause grief and hardships upon others. And that is what my presence have done to you. Forgive me. May Allah continue to show you the Right Path and shower you with His Blessings, and may He forgive us all. The above entry is loosely translated (with some modifications) from the bestselling Malay novel, "Ayat-Ayat Cinta" (Verses of Love) by Habiburrahman El Shirazy. 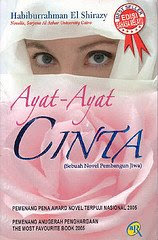 Hehe... ni movie nye pun cam malas nak tengok... since dah baca bukunye... walaupun ramai orang rekomen suruh tengok gak movie nih..